which is apparently what I have done. I made and ordered my Christmas cards this year from Tiny Prints. something has seriously gone amuck. I filled out the forms for my cards to be sent directly from Tiny Prints to my friends and family, you know, to make my life “easier”. Instead, something went wrong and some of my family members and friends have not gotten my cards at all while others have received 3 or more of the same card. Thankfully, my friends and family members are taking it in stride and just laughing at me, calling me a “crazy stalker” or “slightly obsessed” for sending so many duplicates to them, but what really makes me want to cry is not knowing who didn’t receive a card at all. You see, Christmas cards are my thing. I have sent a special photo Christmas card with all of my children to all of my friends and family members since 1996 and the idea that someone I know won’t have our photo gracing their mantle, fridge, garland, what-have-you, makes me sort of want to puke a little. Because, well, Christmas without the Bouffard card is like Christmas without Ralphie in his bunny suit… isn’t it???? So, if you didn’t get your card from me. And please, let me know. Yea me and yea to raising awareness for Autism. I got your card in the mail yesterday. LOVED it! I saw your rant on FB about Tiny Prints sending them to you first…but then saw someone's comment that they got theirs that day…so I wondered if somehow BOTH happened. Hope it all gets straightened out!! you and me both. sheesh! Oh my! So sad! I, too, would be very frustrated. I have sent a family newsletter and special family picture to all of our friends and family since 1984. I can't imagine such a mix-up. The card is AWESOME. What a perfect idea for your family!! I love photo cards, too, Debi. And, that one is really adorable! Sure hope y'all have a fantastic Christmas! Great card! I bet people look forward to getting your cards every year! 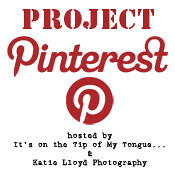 Thanks so much for linking up to Project Pinterest! It's wonderful – LOVE IT! Sorry about your bad mailing experience though – what a bummer! that is really not cool! The card is great though. That sure is a super cute card and idea!